French Montana may have violated the laws of the Sea-Doo Saturday ... because it sure looks like he's drinking on the watercraft. French was traversing the area around Diddy's house, drinking from a Ciroc vodka bottle and looking like a spokesmodel. The photog who shot the pics says the Sea-Doo is owned by Diddy, who BTW also owns Ciroc. Of course it's possible he's doing something promotional for the vodka and it's actually water, but that would seem like the worst promotion ever -- drinking while boating. He's steering with one hand as he takes swigs. And check this out. 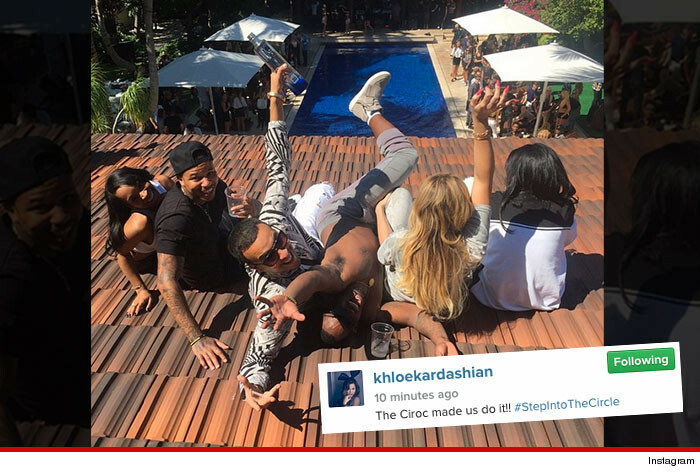 Khloe just posted a photo on top of Diddy's roof, showing them partying with French -- vodka in hand -- with the caption, "The Ciroc made us do it!!#stepIntoTheCircle." We've called French Montana's rep ... so far no word back.